Fears about Hurricane Florence spread south, with the U.S. state of Georgia declaring a state of emergency after officials in the Carolinas urged people to evacuate the coast ahead of the storm's expected pounding winds and rain-driven floods. 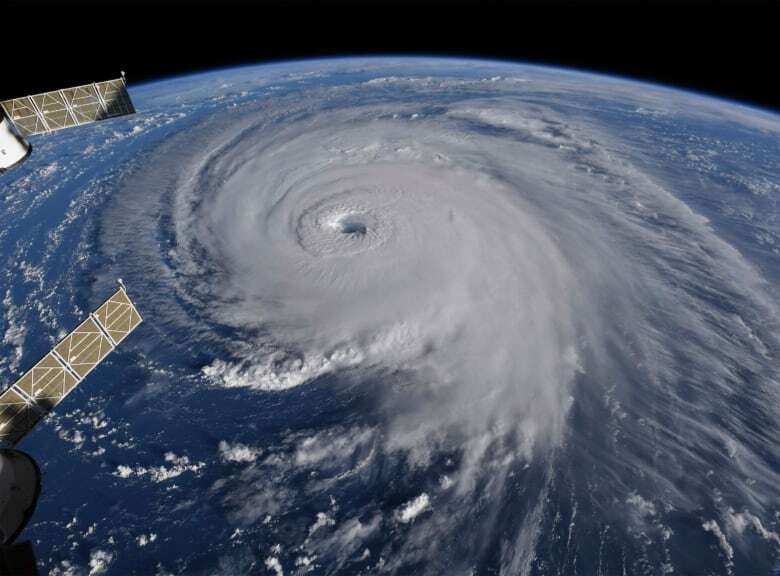 FEMA warns the storm will bring "a Mike Tyson punch to the Carolina coast"
To read Thursday's coverage of Hurricane Florence, click here. 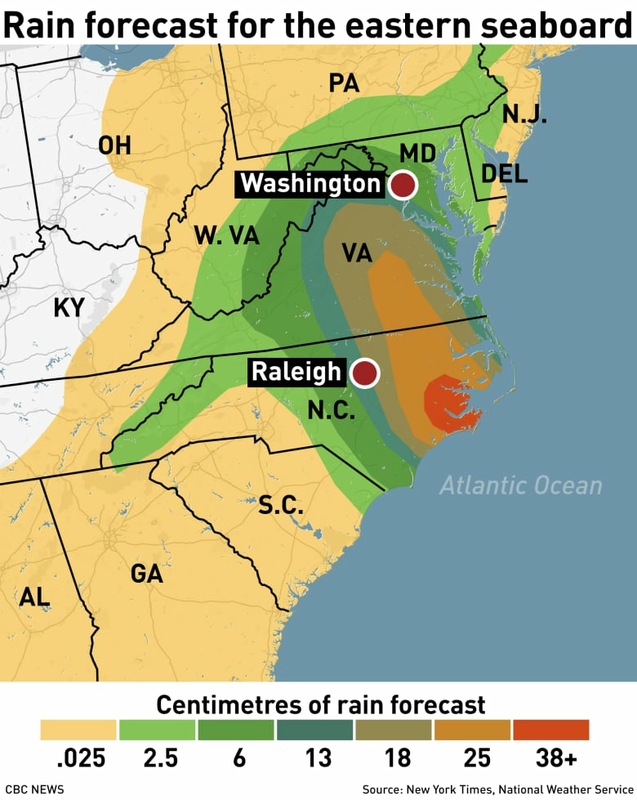 More than 10 million people are in the projected path of Hurricane Florence — and uncertainty over the track of the powerful storm has people worrying across a large swath of the southeast U.S. Faced with new forecasts that showed a more southerly threat, Georgia's governor joined his counterparts in Virginia and North and South Carolina in declaring a state of emergency, and some residents who had thought they were safely out of range boarded up their homes. The National Hurricane Center's best guess was that Florence would blow ashore as early as Friday afternoon around the North Carolina-South Carolina line, then push its rainy way westward with a potential for catastrophic inland flooding. Florence's winds in the afternoon were down to 195 km/h from a high of 225 km/h, and the Category 4 storm fell to a Category 3, with a further slow weakening expected as the storm nears the coast. 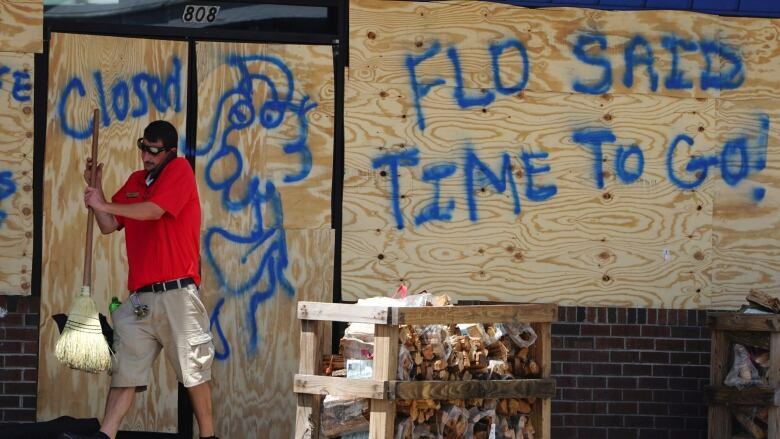 But authorities warned it will still be an extremely dangerous hurricane. Jeff Byard of the Federal Emergency Management Agency (FEMA) invoked a former boxing champion to warn residents that Florence would bring "a Mike Tyson punch to the Carolina coast." "Heed the warnings," said Byard, adding there was "well over $20 billion" in FEMA's disaster relief fund. Georgia's governor declared a state of emergency for all 159 counties. In a news release, Gov. Nathan Deal said the state "is mobilizing all available resources to ensure public safety ahead of Hurricane Florence." No storm watches or warnings were in effect for Georgia, but forecasters said there's an increased chance for tropical storm winds. "It is highly unusual for a storm to turn south down the coast," said CBC meteorologist Johanna Wagstaffe. "Two high pressure systems are blocking Florence from moving inland, but one high-pressure system may be slightly stronger, hence the unusual steering pattern." The European hurricane simulation model, which has had a high degree of accuracy in recent years, "is predicting no landfall Friday morning before the turn south, which described as the worst-case scenario. "Keeping the eye [of the hurricane] over the warm waters means it keeps its strength." The NHC said the storm is about 595 km east-southeast of Myrtle Beach, S.C., as of Wednesday evening. The Canadian government has warned citizens against travel to the stretch of the U.S. East Coast that is expected to be hammered by Florence. Forecasters said Florence was expected to blow ashore and then slow down and dump 30 to 60 centimetres of rain through at least Sunday, which could cause flooding well inland and wreak environmental havoc by washing over industrial waste sites and hog farms. There are predictions of up to 30 centimetres in places in the Appalachian mountains. "This rainfall would produce catastrophic flash flooding and significant river flooding," forecasters said Wednesday, with the National Weather Service calling the projected rainfall numbers "hard to comprehend." Donald Trump earlier this week declared a state of emergency for North and South Carolina and Virginia, opening the way for federal aid. In a video recorded on the White House lawn and sent on his Twitter account early Wednesday, the president expressed confidence in the preparedness of first responders and the Federal Emergency Management Agency (FEMA). "But despite that," Trump warned, "bad things can happen when you're talking about a storm this size. It's called Mother Nature." At a news conference Wednesday in Washington, Jeff Byard of FEMA also said it was imperative locals heed the evacuation warnings. 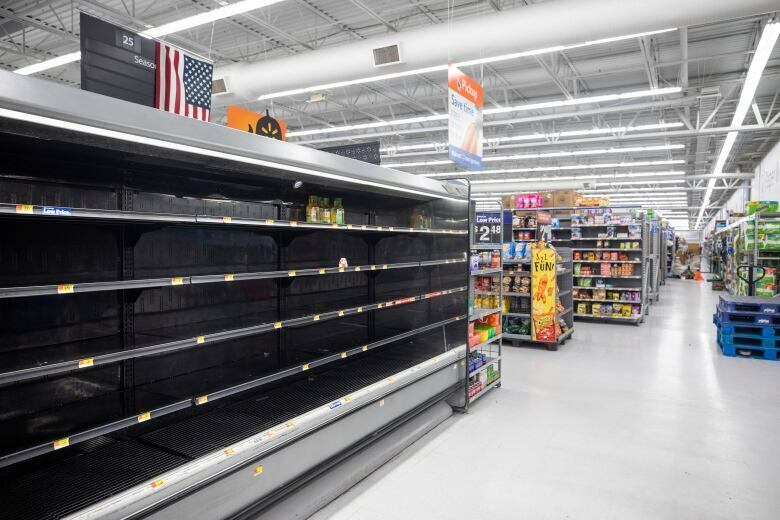 Federal officials have urged residents to put together emergency kits and have a plan on where to go, though getting out of harm's way could prove arduous. For many of those under evacuation orders, getting out of harm's way has proved difficult, as airlines cancelled flights and motorists had a hard time finding gas. 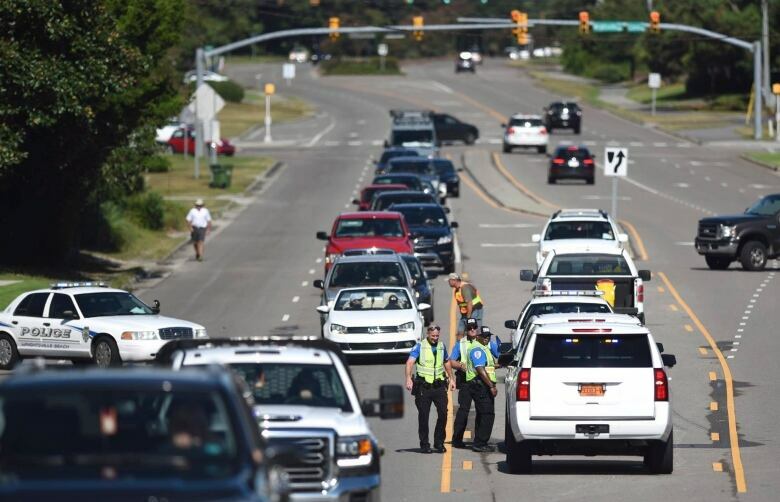 Michelle Stober loaded up valuables on Tuesday at her home on Wrightsville Beach to take back to her primary residence in Cary, N.C. Finding fuel for the journey was tough. People across the region rushed to buy bottled water and other supplies, board up their homes, pull their boats out of the water and get out of town. Some store shelves were picked clean. Carolina, Naval Station Norfolk in Virginia and the Marine Corps Recruit Depot on Parris Island in South Carolina. The Navy, Air Force and Army were moving ships and aircraft out of harm's way. 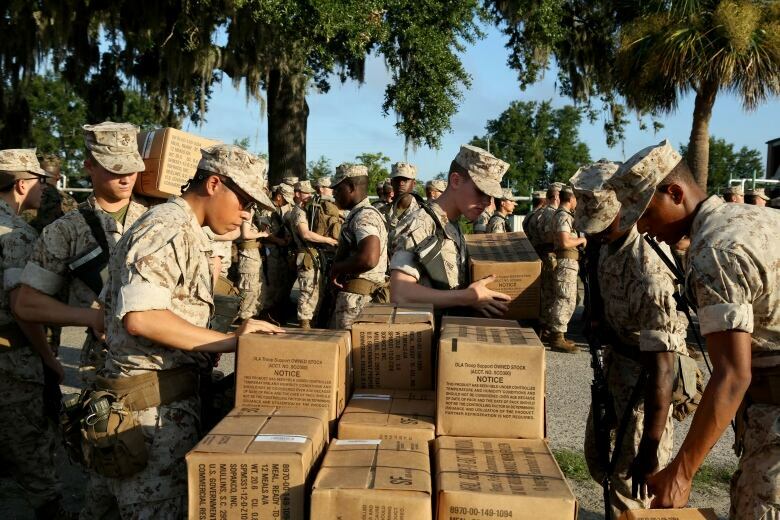 Thousands of Marines and their families evacuated from Camp Lejeune, leaving the rest to dig in ahead of what could be a direct hit. Despite the warning from the state governor and other officials, some residents like 65-year-old Liz Browning Fox plan to ride the storm out in the Outer Banks village of Buxton, N.C., despite a mandatory evacuation order. Her 88-year-old mother refused to evacuate and Fox will stay with her. "Everyone who is staying here is either a real old timer, someone who doesn't know where would be better, or someone involved in emergency operations one way or another," she said.